The JCRA Board of Advisors and staff set four strategic planning goals that were developed to provide a plan for achievements and growth over the next five years. There are a number of objectives listed under each goal, and we are examining and evaluating our progress and successes during monthly staff meetings. In addition, our Board of Advisors continues to be actively involved through monthly communications that I am personally sending to them. Since you, our dedicated members and volunteers, are vital stakeholders with the JC Raulston Arboretum, I want to share these strategic goals and important information with you. We value your ideas and opinions, so, please, share this journey with us. Nancy Simenson and Jennie Cowan provide instruction during "Wake Up! It's Spring!" 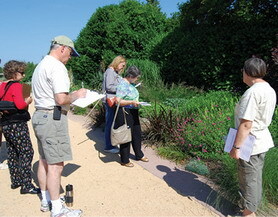 Visitors enjoy and support the JCRA because of their garden experiences, so it is critical that the Arboretum continue its Master Plan development and diverse plant collections. The JCRA must be an aesthetically pleasing place to visit, but it must also stay on the cutting edge of new plant research and plant collection displays. As we persist in setting high garden standards, we have recently accomplished several goals. The Lath House construction is now completed. Its walkway paths and walls are under construction. New installation of short walls and pathways in the Asian Valley is another new project that is soon to be completed. A new path to the Certified Plantsman Collection and the container trials was installed, allowing easier public, student, and industry access. A new, innovative crevice garden has been proposed near the A. E. Finley Rooftop Terrace entrance, and we are seeking funding for this exciting new project. We are also seeking grant funding to install an accessible Chapel Hill gravel path through the developing Plantsman's Woods and Annual Color Trials areas as part of our goal to provide safe and easy pathways throughout the JCRA. The JCRA has long benefitted from seed exchanges with other research institutions around the world. 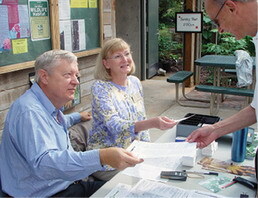 In 2010, with grant funding from the Stanley Smith Horticultural Trust, the Arboretum initiated its first ever formal Index semina (seed exchange) program. 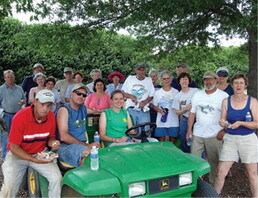 Throughout the summer and fall of 2010, dedicated volunteers collected and cleaned seed from the JCRA collections. A list was sent out to botanic gardens and research facilities around the globe in early 2011 and requests from these institutions were filled and mailed out this spring. Our inaugural Index seminum sent seed to eight countries from Korea through Europe and Canada and states across the United States. We anticipate an even wider participant pool in 2012. As donor and friend of the JCRA, Bobby Wilder, so aptly stated to a garden visitor, "Yes, the Arboretum is free and open to the public, but it's not free to operate!" The financial security of the JCRA is a top priority, and the following are recent accomplishments, challenges, and new funding opportunities in this area. The main fund-raiser is, of course, the Gala in the Garden. It was the best weather on the first Sunday in May for nearly a decade, and the JCRA celebrated another successful Gala. 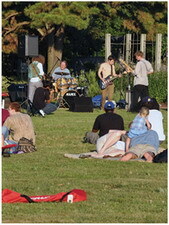 Even with more than 500 attendees, the open, spacious atmosphere of the events lawn was enjoyed by everyone. Thanks to our sponsors, guests, nursery partners, and auction donations, net proceeds for the Gala exceeded $80,000. The JCRA is so fortunate to have many generous major donors and friends who continue to support our Master Plan initiative, new plant collections, the student internship program, the JCRA endowments, and many other initiatives over and above general operational support. During the last fiscal year, nearly $200,000 was given, and the Arboretum would not be where it is today without this support. Historically, the JCRA staff have always been frugal and managed spending carefully, so the operational budget has held steady for many years. The Arboretum's main sources of funding for daily operations include membership revenue, rental receipts, the Gala in the Garden, and other fund-raising initiatives. These main sources of operational income have sustained the JCRA thus far, but the economic climate has definitely changed this year. The state budget funding crisis has impacted everyone, and the JCRA is no exception. With the loss of salary funding for 1.5 JCRA staff positions originally paid from state funds, the Arboretum must look for new ideas and funding sources to meet this new 12.5% increase over last year's operational budget. Every member of our JCRA staff is important, so generating new income to support the existing staff positions and eventually add new positions is something that we must do and can do! We must increase our memberships. New programs, incentives, and benefits continue to add value to the membership program; now we must all help recruit new members! We have on-going lapsed membership appeals, and there are new initiatives to increase membership awareness in the gardens and around the community. In addition, the JCRA board and staff are looking for and developing creative ideas and new partnerships opportunities that will create additional operational revenue. We are also quite open to and interested in new ideas that our constituents suggest. One of the reasons that JCRA membership is a "heck of a bargain" is the benefit of outstanding lectures and programs that are offered, but we plan to expand this area in an effort to better serve our current members and attract new ones. The February 26, 2011, Half-day Symposium, featuring a dynamic speaker line-up, was sold out, and the net profit was nearly $7,000. 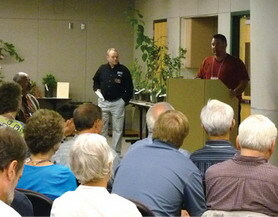 The September 23 and 24, 2011, 35th Anniversary Symposium featured a local nursery tour and another marvelous array of speakers. This symposium�s net profit was over $10,000. Our propagation workshops are also very popular and always a sell-out. Considering the high level of interest in this area, planning has begun for a grafting workshop in addition to more propagation workshops. One of the big highlights from spring 2011 was a successful launch of our new JCRA Children's Program. Caroline Richardson, children's program coordinator, and 16 trained volunteers conducted the programs, beginning with the March 26 "Wake Up! It's Spring!" workshop, followed by the May 7 "Mayday! Mayday!" workshop, and the May 23 "Superhero Plants: Protectors of Clean Water" workshop. These new programs proved to be a huge success for more than 100 children and their parents. In addition, several excellent children's programs have taken place this fall and several more are scheduled, including family programs, homeschooler programs, and school's out programs during teacher workdays. The JCRA children's programs are developed for children ages five and up, and they are tied to special JCRA membership discounts. We believe that parents will see the value and benefits of JCRA membership by giving their children the opportunity to learn the science of plants while receiving lessons in appreciation and respect for their world. These new children's programs are beginning to generate income to cover program expenses, and a special fund-raising appeal has been targeted for additional support to help grow this new program. Continuing with our mission of education and public outreach, the "London, Plus Gardens!" 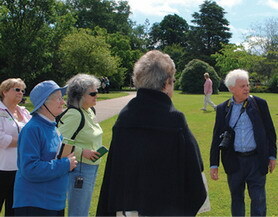 excursion was a big hit with the 20 participants who enjoyed a variety of garden tours, including personal experiences with notable English gardening legends Roy Lancaster and Beth Chatto. Plans for future educational travel, including day trips, weekend tours, and extended excursions, are being discussed and planned. Please be sure to share your ideas and wish list with our staff! We are so fortunate to have two talented and knowledgeable JCRA volunteers dedicating their time to a series of classes. Charlie Kidder (past board member) has been teaching a year-long course titled "The Year in Trees and Shrubs, Etc.," and Cheryl Kearns (current board member) taught a series of herbaceous perennials classes during 2011. Another new idea for future programs may include a fruits and vegetable tasting event in conjunction with a horticultural foods nutrition workshop in summer 2012. Additionally, numerous partnering programs with various plant societies, associations, and garden clubs are also in progress for expanding program offerings. Some very exciting additions and upgrades are happening in this area. Wireless service has been installed indoors and outdoors around the Ruby C. McSwain Education Center and the Bobby G. Wilder Visitor Center, so guests using laptops and other portable devices are now connected. QR (Quick Response) codes are now available on a number of signs in the gardens and provide on-the-spot learning opportunities. Just point your smartphone or other mobile device at the QR code and learn more about what's right in front of you. Of course, the JCRA Web site always has something new with "Now Showing" and the JCRA events calendar. New signage in and around the Arboretum will also enhance our visitors' garden experience with new opportunities to learn about plant collections, the membership program, and so much more. We are proud of our arboretum. We must give a clear message to everyday visitors that membership is a good value and vital for preserving this valuable resource. The Board of Advisors and staff are committed to these strategic goals and the continued success and growth of the JC Raulston Arboretum. I know that you are too! You know, many people just don't know that the JCRA is here. We are "Raleigh's Garden"—so let's all spread the word! A session at last year's American Public Garden Association conference, "Innovations in Membership," focused on the reasons members join institutions and stay engaged—mission vs. value. While we at the JC Raulston Arboretum at NC State University believe our members get great value for their membership through fantastic education programs, special events, and our famous free plant distribution (check out our YouTube Channel—JCRaulstonArboretum—for the quickest 10 minutes in horticulture), our members respond passionately to our mission. This passion can translate into extraordinary results, as in the case of our Master Plan. Master plans are invaluable tools for fostering a cohesive vision for botanic gardens and arboreta. Too many institutions have a master plan on file which relates little to the day-to-day function of the organization, and small institutions are often the worst about having a true master site plan to guide their development. 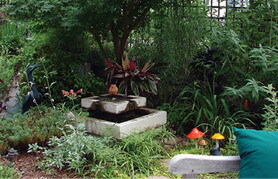 Many small gardens are haphazardly created on the whims of an interested volunteer, staff member, or donor. While the enthusiasm of both paid and unpaid staff shouldn't be checked, these gardens should fit harmoniously with the whole. The JCRA, using an early master plan, spent the 1990s and the early 2000s raising money for the construction of a visitor center and education building. A 2005 American Association of Museums review highlighted the lack of a post-construction master site plan for the JCRA following the completion of the Ruby C. McSwain Education Center. In response to this need, a volunteer committee comprised of landscape architects, landscape designers, an artist, and a nurseryman came forward from our own membership and offered to develop a physical and interpretive master plan for the JCRA. This "Grass-roots" Master Plan committee, as it came to be known, was a group of very talented individuals with a history of involvement with the JCRA. They were intimately aware of who we are and passionate about our mission to "… promote responsible, inspirational design and management of cultivated landscapes through plant development and evaluation, as well as academic and public education." As proof of their understanding of our mission and outlook, the final report from the committee was titled "It's All About the Plants." The late J. C. Raulston would have been proud. The group met every Thursday morning for over a year to develop the final report and plan, which were unanimously approved by the board in 2007 and embraced by the staff and members of the JCRA. The Master Plan has since guided our development both in terms of fund-raising and garden installation/renovation. After completion of the plan, several members rotated off the committee while other members joined, providing both continuity and fresh vision, enthusiasm, and ideas. The committee continues to meet every other week, guiding projects to completion, helping write Requests for Proposals, interacting with outside contractors, and soliciting in-kind donations. Their enthusiasm and passion has helped inspire generous gifts, allowing us to complete projects even during the economic downturn of the last few years. Execution of the entire plan is envisioned as a long-term project for the next decade and beyond. The Master Plan committee is in the process of transitioning from a design focus to more of an implementation emphasis and is considering the addition of landscape contractors and estimators to the group to fill gaps in the collective knowledge pool. Their continued commitment will prove invaluable as we develop estimates on future garden projects for fund-raising purposes, design new spaces, and work with student design and construction classes. The Master Plan committee is just one of many passionately engaged volunteer and member groups at the JCRA. These volunteers help keep the staff energized and focused on our mission even when times are tough. The give-and-take and respect on both sides challenges us to continually improve, even during taxing times. Each year, visitors and volunteers alike leave me messages saying that this plant or that is being eaten alive by "worms." I am very much aware of the plants being eaten most of the time. 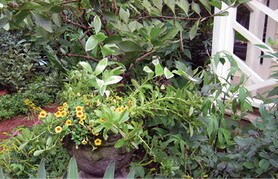 In many cases, they were planted as host plants for butterfly larva as well as ornamental value. One plant, Aristolochia fimbriata, disappears each year back into the ground two to four times as a result of one of these "worm" infestations. Growing in the Geophyte Border, this fleshy-rooted, herbaceous, sprawling perennial creeps at the bases of the sword- and strap-shaped foliage of its neighbors, breaking up the monotony with its own round, silver-veined leaves and strange, tobacco-pipe shaped flowers. Two to four times each summer, though, it sacrifices its foliage, flowers, stems, and even seedpods to the voracious appetite of "worms." 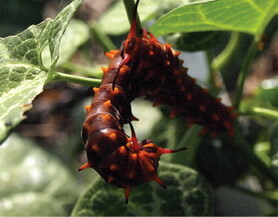 Actually these "worms" are larvae of the pipevine swallowtail butterfly (Battus philenor). Visitors become worried when they see the larvae that are reminiscent of little devils, being orange-red to orange-brown in color and covered in what look like sharp (actually, rubbery) spines along the body. To the contrary, though, the little devils' only insidious secret is that they contain poison, though are harmless unless eaten. 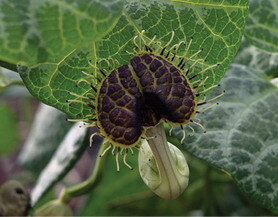 The poison comes from the Aristolochia plant itself and protects the larvae and adult butterflies from being eaten by birds. Both the coloration of the larvae and the butterflies signal to birds that they taste bad and contain poison. 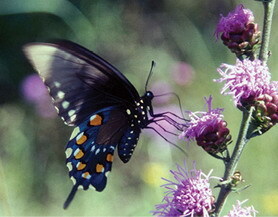 Other butterflies, in fact, mimic the coloration of the pipevine swallowtail to trick birds into not eating them. 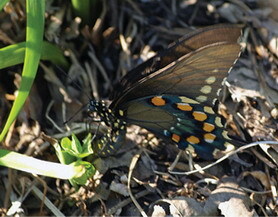 A week or two following the demise of the above-ground shoots of the plants, a crop of adult butterflies begins to emerge and provides gardeners and visitors alike with a spectacular show of black-with-metallic-blue highlighted butterflies fluttering among the surrounding flowers. Well worth the loss of the plant for a few weeks. Back to A. fimbriata, other species of Aristolochia provide the same nourishment to butterflies, but many of them are large vines that are difficult to work into today's small gardens. Aristolochia fimbriata, on the other hand, only grows about 6"–8" tall, but can spread 3' wide. It self-sows once established and acts as a summer ground cover, weaving in and out among the surrounding plants when not being eaten. Although a native of Argentina and Brazil, it is fully hardy into zone 7 and tolerant of a wide variety of conditions, growing in moist to dry soils, in sun to partial shade. 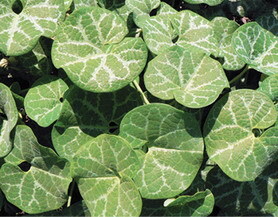 The foliage varies from form to form with some having solid green leaves, but the most frequently seen forms have a silver vein pattern on the surface of the leaves. The flowers, as mentioned earlier, are shaped like a tobacco-pipe. The open end of the flower is edged in wiry filaments that lead the eye down into the center of the burgundy insides of the flowers. The exterior of the flower is a creamy pale green. After they are eaten back, only a few weeks are needed for the plant to recover from the scalping by the larvae. There are a few other familiar plants in the garden munched on by butterfly larvae. Asclepias species, Gomphocarpus physocarpus, and Tweedia solanoides are eaten by the monarch butterfly (Danaus plexippus). Passiflora species and hybrids are food for Gulf fritillaries (Agraulis vanillae) and variegated fritillary (Euptoieta claudia). Ruta species and Foeniculum vulgare 'Purpureum' are eaten by black swallowtail butterflies (Papilio polyxenes). Plant a few of these in your own garden to enjoy both the plants and the butterflies! Each year, a selection of plants from the JC Raulston Arboretum is distributed to N.C. nurserymen, Extension agents, other public gardens, and others at the North Carolina Nursery and Landscape Association's Summer Green Show as a means of spreading new or uncommon plants through the state for trial observation and possible commercial production. Since 1980, tens of thousands of hundreds of taxa have been distributed. We distributed ten taxa this year including one JCRA introduction and a plant from Mark Weathington and Tony Avent's 2009 plant collecting trip to Taiwan. The only Asian species of an otherwise North American herbaceous perennial, this plant forms a tight clump of upright stems to about 18"–24" tall. 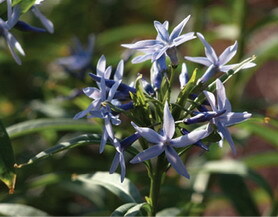 The stems, clothed in lanceolate leaves, are topped in spring by clusters of pale blue starry flowers. Fall color is a nice gold. We've found this to be an exceptional perennial for the garden. A tough plant for full sun to light shade and most soils. Propagates easily by cuttings in late spring or summer or by seed with a 90-day cold stratification. 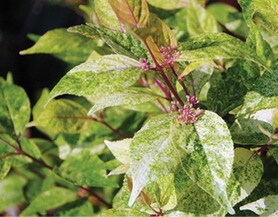 A heavily variegated form of beautyberry with green leaves splashed and speckled with white. New growth emerges pink and young stems are pink. Unlike the typical Japanese beautyberries, this form seems to grow somewhat upright and is heavily branched with none of the arching characteristics usually seen. Flowers are pinkish and so far we have seen no fruit set. Our plant has been surprisingly vigorous for the amount of variegation and has not burned in full sun with minimal irrigation. Propagates easily from cuttings. This is a great white flowered form of the underutilized Griffith's leadwort. 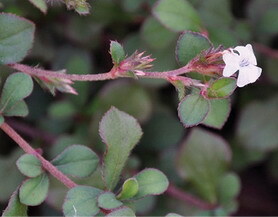 It forms a low subshrub to about 2' tall and 3'–4' wide. The twiggy branches are covered in small, rounded, wavy-edged leaves which turn shades of purple and brilliant red in fall. In late summer, dime-sized plumbago-like flowers appear when little else is happening in the garden. 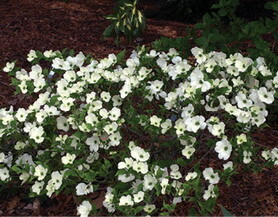 It is a quick grower and combines well with other shrubs or perennials. In central North Carolina, it is best cut back in the winter like an herbaceous perennial, but should be semi-evergreen in warmer spots. Somewhat drought tolerant once established. Supposedly deer do not like this leadwort, but don't blame us if the deer don't read this. Summer cuttings seem to root in hours and full gallon plants could probably be produced within a few weeks of being stuck. A most unusual and highly-desired form of our native flowering dogwood, 'Suwanee Squat' is the most height-challenged member of this group. It can ultimately grow to 6'+ tall with a spread two to three times as wide although it seems to be in no hurry to reach so high. 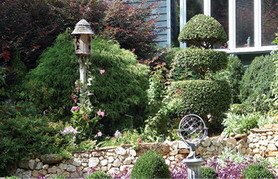 Ours in the Mixed Border is only about 18"–24" tall and every bit of 48" wide. It flowers heavily and does not have the contorted leaves so common in the awkward weeping forms of dogwood. We've been told this is tough to grow, but our plant seems perfectly happy in a mostly shaded spot in good soil. Part sun to shade. We propagate it from softwood cuttings in mid-May to early June with good success. Plants can also be grafted on seedling rootstock. We've grown this bald cypress relative for many years at the JCRA where it has graced the entrance to the Klein-Pringle White Garden. 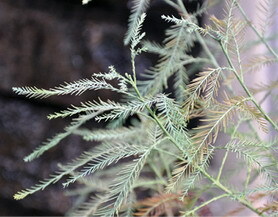 Like Taxodium, it is deciduous with soft, pale green needles which become smaller and scale-like on mature shoots. In the wild, it can grow to nearly 100' and will form cypress knees if grown in or near water. In drier locations, the knees do not form and the growth will be much reduced. The crown is irregularly shaped and typically quite open, making it suitable for gardening underneath. The bark peels in attractive gray strips. Seed germinates readily when available. We have not tried rooting this species, but it may root like a Taxodium and would likely graft on Taxodium rootstock. Much healthier for you than 'Ham and Eggs', this sport found and named at the JCRA is a lovely pastel combination of citrus colors that starts soft lemon yellow in the morning, and slowly transforms to tangerine before becoming pink-grapefruit-toned. The soft colors work well in most landscapes. 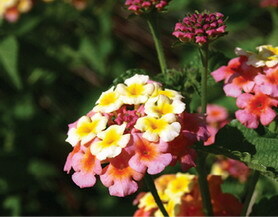 Like its parent, 'Ham and Eggs', this is an exceptionally hardy form of lantana that is close to sterile. This is the first ever offering of this plant. Propagates and grows quickly from cuttings. We think the world of this small- to medium-sized evergreen tree. 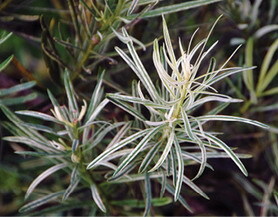 The new foliage emerges covered in soft, silky, golden hairs which show to great advantage against the olive green foliage. 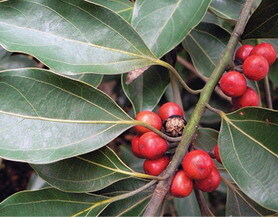 Small yellow flowers give rise to red fruits. This plant grows well in central North Carolina. It has been growing in the Arboretum for over a decade in a shady spot. It grows quickly from fresh seed. We have not worked on rooting this plant yet. We received this excellent unnamed podocarp from our good friends at the Atlanta Botanic Garden about seven years ago and finally planted it in 2009. We weren't sure it would make a good garden plant due to its heavy variegation, but it is proving to be outstanding. Most variegated Japanese yew pines are known as 'Okina', despite being different clones. This plant beats every other form we've ever seen and has been great even in full sun. Podocarps root easily at most any time of year. We collected this high-elevation, sun-loving, herbaceous perennial in Taiwan in 2008. This species was only described in 2007 and has not made its way into the trade as yet. The upright stems are topped from mid-summer to frost with loads of three-petaled, purple-spotted flowers. 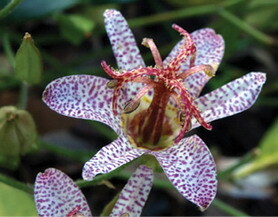 The flower production beats any other toadlily we've come across so far. It prefers full sun. Cuttings root easily all summer, but should be taken early before every stem is capped with flowers. We collected this viburnum in Taiwan in 2009. 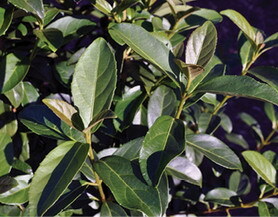 It forms a relatively large shrub with large, glossy, evergreen foliage. Loose panicles of white flowers are followed by masses of bright red fruits. We haven't planted this out yet, but, based on the other plants growing nearby, expect it to be hardy in central North Carolina. It grows quickly from fresh seed and we expect it will root from hardwood cuttings with bottom heat. The JCRA's Propagation Guide for Woody Plants is once again available for purchase. Lulu.com sales of this book benefit the intern program at the JC Raulston Arboretum and on-site sales benefit the volunteer program. The purpose of this manual is to disseminate some of the information we have developed over the years on the propagation of our collection of woody plants. As Ted mentioned in his opening article, the JCRA is a free resource and a beautiful garden for the public to visit, but it is not free to operate. Your membership does make a difference, and we thank you for your continued support and advocacy of the JC Raulston Arboretum! Your membership gifts support daily operations at the JCRA. They are an investment in the vital research and education that impacts North Carolina's very important green industry. Plus, your membership gifts provide a tranquil, beautiful, and educational garden experience for the public. Membership at the JCRA has always been a good value, not only for the direct benefits that members receive, but also for the offerings of outstanding lectures, free plants, discounts for workshops and area businesses, and lower entry fees at reciprocal gardens throughout the country. Due to increased general operational expenses and many budgetary cuts, the JCRA board has approved an increase in membership dues beginning in January 2012. However, members may lock in their current membership rate for up to two years, if they renew online or contact the membership office before December 31, 2011. Members have been sent two announcements with all the new membership levels and benefits via e-mail already and a reminder will be sent in December. If you have any questions regarding your membership, please contact Anne Porter at (919) 513-3826 or anne_porter@ncsu.edu or Judy Morgan-Davis at (919) 513-0264 or jvmorgan@ncsu.edu. If money were not an issue, what would you do for the JC Raulston Arboretum? This was the "Howling Cow Contest" question posed to members, volunteers, and friends in the July e-Update. Thanks to the more than 30 people who submitted their ideas. The responses were very thoughtful and enlightening. Take a look below, and let us know what you think. A special congratulations to Trish MacPherson for winning a three-gallon container of NC State's Howling Cow ice cream. So when should we come over for the ice cream party, Trish? billboards at every major entry point in North Carolina that reads—"The Secret Garden … It's no longer in the book—it has escaped to Raleigh,"
many, many billboards on all the main roads and highways around Raleigh (and North Carolina) with a fabulous JCRA picture and a caption that reads—"BEST FREE GARDEN IN THE SOUTHEAST!" The contest may be over, but the JCRA Board of Advisors, director, and staff are still very interested in what you have to say. All ideas and comments will be reviewed and may be added to our JCRA wish list. Many of these ideas may become a reality sooner than you think! The JC Raulston Arboretum is extremely fortunate to have so many talented friends and donors. If you are a member making news, or know of one, please let us know so that we can share it with our arboretum friends. Debbie Hamrick – On April 13, the NC State University chapter of Gamma Sigma Delta (GSD), the Honor Society of Agriculture, recognized and honored academic achievement and contributions to agriculture by faculty, students, staff, and alumni of the College of Agriculture and Life Sciences, as well as the College of Natural Resources and the College of Veterinary Medicine. 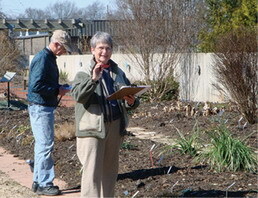 Debbie, a 1981 graduate in horticultural science, was honored with the 2011 GSD alumni initiates. Debbie is director of specialty crops and member of the public policy staff of the N.C. Farm Bureau Federation, and is nationally known as an advocate for agriculture. She works on behalf of emerging agricultural enterprises, such as aquaculture, apiculture, viticulture and ornamental horticulture, and is a supporter of the state's local foods and agricultural products. Prior to joining the Farm Bureau, she founded the flower industry magazine FloraCulture International. Debbie served as president of the JCRA Board of Advisors from 2007 to 2010, and she continues to be an active advocate, donor, and friend of the Arboretum. Congratulations, Debbie! You are an amazing and talented lady! Nina and Jerry Jackson – In April, Nina and Jerry received the 2011 Bowers Medal of Arts from Arts NC State—recognizing them for their leadership and achievements supporting the arts at NC State, including providing one of the lead gifts in the capital campaign to renovate Frank Thompson Hall. Jerry, the 2011–2012 chair for the JCRA's Board of Advisors, and Nina were the honorary chairs for the 2010 Gala in the Garden. Congratulations, Nina and Jerry! We appreciate all that you have done and continue to do for the Arboretum and NC State University. Chris Cammarene-Wessel – In June, Chris received the 2011 Professional Achievement Award from the National Agricultural Alumni and Development Association (NAADA). Chris is a seasoned professional development officer and a long-time member of the JCRA. She has been a very important part of the CALS Advancement staff, playing an integral role in the registration and silent auction component of JCRA's Gala in the Garden. The Gala would not be the same without Chris's expert assistance. Congratulations, Chris, on a well-deserved recognition! Thanks for all you do! Bruce Clodfelter – JCRA member since 1996 and Charlotte landscape architect, Bruce's garden was featured in June's Good Housekeeping magazine. Congratulations, Bruce! When may we come for a visit? Michelle and Tony Avent – Long-time members and friends of the JCRA, Michele and Tony were recognized by the Perennial Plant Association with the PPA Retail Award. Founders and owners of Plant Delights Nursery (http://www.plantdelights.com), an international mail order nursery specializing in rare and unusual perennials, they received the 2011 Perennial Plant Association Retail Award at its recent annual symposium in Atlanta, Georgia, on July 19, 2011. The award is presented to a firm "in recognition of being a commercial representative instrumental in making their operation the most progressive and successful in providing outstanding marketing and customer service in perennials." Congratulations and well done, Michelle and Tony! Here's to many more years of great success! 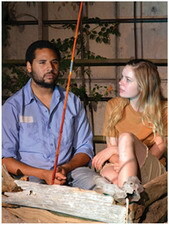 Gala in the Garden: 2011 May Day Gala Was a Great Success! 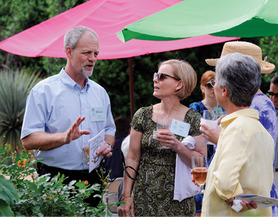 The JC Raulston Arboretum enjoyed one of its most glorious May galas in recent times. The weather was stunningly beautiful, and the new event space was a big hit. 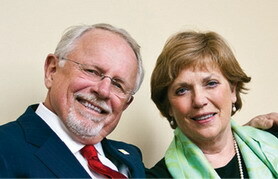 Susan Woodson (NC State's first lady) was the 2011 honorary chair and Jere Stevens (JCRA Board of Advisors) served as the 2011 event chair. This dynamic duo, along with their outstanding Gala committee, created a May Day experience enjoyed by the more than 500 guests celebrating the day. Gala decorations committee chair, John Buettner, created a fantasy May Pole that was the center of attention, around which guests did their share of dancing, feasting, auction shopping, and celebrating spring in a big way! Thanks to the Gala sponsors, guests, auction donors, and many friends, this year's net proceeds exceeded the $80,000 goal! Gala proceeds directly support the Arboretum's daily operational support—another great reason to celebrate this special May Day event! Remember to mark your calendars for the 2012 Gala in the Garden—always the first Sunday in May—Sunday, May 6, 2012, at 3:00 PM. Please visit our Web site to relive the May Day Gala in pictures! Since 2006, more than $20,000 has been given to the JC Raulston Arboretum through the partnership with the Garden Conservancy's Open Days Program. This would not have been possible without the gracious garden hosts who open their gardens and designated the JCRA as the non-profit organization of their choice. We are sincerely grateful to the 2011 hosts who cordially opened their private gardens and lovingly nurtured them throughout the summer's drought. Thanks for a weekend of remarkable garden delights! 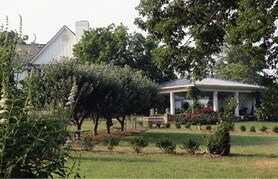 Garden hosts included Barbara and Loren Kennedy, C. J. Dykes, Alta Chalmers, Bob and Linda Hatcher, and Wayne Freeman and Cronin Byrd. It was an inspiration to visit each garden with its distinctive design and plant collections. We also deeply appreciate JCRA member, volunteer, and Garden Conservancy regional representative, Jayme Bednarczyk, for her talents and dedication in coordinating this program. 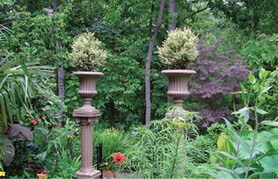 For more information regarding the Garden Conservancy's Open Days Program and to see a complete schedule of upcoming Open Days gardens throughout the country, please visit their Web site at http://www.gardenconservancy.org/. If you are interested in opening your garden for a future garden tour, please contact Anne Porter at anne_porter@ncsu.edu or (919) 513-3826. Do You Have a Vision for the JC Raulston Arboretum? We are parents, grandparents, farmers, artists, professors, retirees, students … but all children at heart when it comes to a garden. 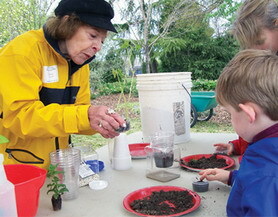 JCRA visitors come to the Arboretum with their own appreciation for its treasures, yet four-year-olds and 60-year-olds find themselves leaning over the same spots with equal delight and curiosity. The Arboretum is a magical place! Many garden and plant lovers before us made their visions reality. J. C. Raulston was the first to envision a place to teach and research his beloved plants, and many donors and friends have followed in his footsteps. The JCRA Japanese Garden that you see today was renovated in 2010 thanks to a generous gift and a will bequest from Donald Moreland, a devoted garden lover who had such vision that he left a legacy that will delight generations to come. you can direct your gift to a particular purpose—be sure to check with us to make sure your gift can be used as intended. 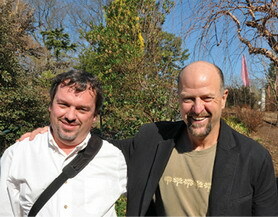 Please visit and talk with me about your vision for the JC Raulston Arboretum! For questions, please contact me at (919) 513-0637 or sonia_murpy@ncsu.edu. For more information on this or other giving opportunities, please contact Anne Porter at anne_porter@ncsu.edu or (919) 513-3826. Or visit http://www.cals.ncsu.edu/advancement/ for more details. Our volunteers were very busy this past spring, summer, and fall. Besides our usual events, such as the Winter Walk and Gala in the Garden, we've added volunteers to our Children's Program which is off to a terrific start. This year, two of our garden volunteers, Josh Fulford and John Suggs, were selected to be part of our Summer Intern Program. 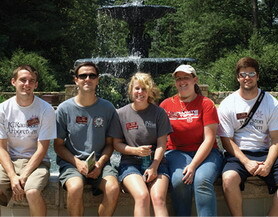 Along with our other interns, they learned many aspects of the Arboretum. Even in the summer heat, we had many volunteers who helped every week. 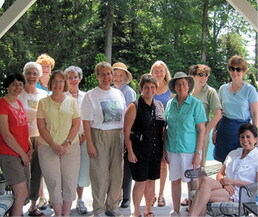 All our volunteers deserve a big thank you for making the Arboretum a wonderful garden to visit and enjoy. 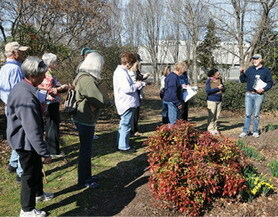 A group of volunteers enjoyed a trip to Graham Ray's beautiful garden in Greensboro, North Carolina. 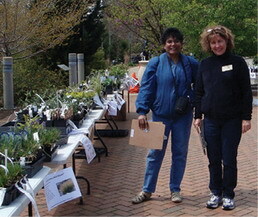 Volunteers Katherine Raj and Becky Lee stand ready to help customers at our spring plant sale. Planting the Annual Color Trials is always a lot of fun and takes quite a few volunteers. The volunteers and staff are enjoying lunch after another successful planting. 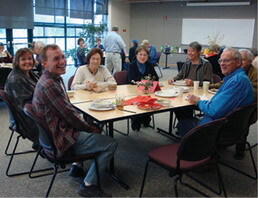 The Soup and Salad Lunch is always very popular with volunteers and staff. The homemade soups are welcome on a cool day. Sandy Reid (center) has been a long-term volunteer who helped out in many areas. She and her husband just moved to Asheville, North Carolina, and she will be missed very much. Thank you, Sandy, for your many hours of volunteering. Making sure our plants are properly labeled is an ongoing job. Laddie Munger and Margaret Jordan are reviewing the Geophyte Border. We have many new volunteers to welcome. They are a dedicated group with many talents and skills to offer. Some skills we particularly need are design, marketing, and promotion. If you have a special skill to offer, we would like to talk to you.